Media suicide watch: It’s working! In an alarming new trend, members of the media have been killing off their own credibility at an alarming rate in an effort to help a powerful corporation downplay a string of suicides at a labor camp manufacturing facility in China. All of these media outlets are promoting the ridiculous notion that Foxconn’s suicide epidemic is not an epidemic at all, because it’s way below the national average suicide rate in China. Why are so many members of the media suddenly committing professional suicide at such an alarming rate? Some believe the media workers can no longer bear the slow death of their industry and just want to end their misery. Others blame brutal working conditions, especially for those employed by online publications. These “bloggers” and “aggregators” spend 10 to 12 hours a day chained to computer monitors, doing incredibly boring and meaningless work, for little or no pay, and are routinely abused by their managers. The Times Online which says something about throwing rice into the air and how you can’t control where it lands and therefore there is no “trend” at Foxconn. MacDailyNews, which cites an article in People’s Daily Online, “the organ of the Central Committee of the Communist Party of China,” which reports that “this is an instance of media hysteria and disregard for statistical facts.” Highly recommended, MacDailyNews says. Because honestly, if you can’t trust the Central Committee, who can you trust? People’s Daily Online, which provides intelligent, straightforward on that crazy hysteria, and determines that Foxconn is not to blame. 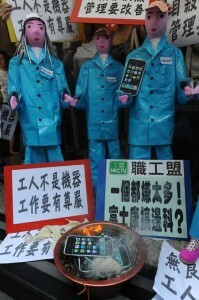 The Unofficial Apple Weblog cites Gruber claiming that Foxconn is below the national average for China. Tom Foremski at ZDNet who points out that France Telecom had a suicide epidemic and it was way worse than the one at Foxconn. Tom’s Hardware, which compares Foxconn to the national average and finds those lazy, cowardly slackers at Foxconn falling far behind their countrymen. Business Insider, which compares Foxconn suicide rate to that of all 50 states in the U.S. and finds, once again, Foxconn workers coming up short. CrunchGear, which says Foxconn is nothing compared to Cornell, where kids are killing themselves all the time, and it’s not fair to blame Foxconn for its worker suicides because Foxconn actually treats them really well so there must be some other explanation. Gizmodo, which cites the Telegraph and says it’s performing a “fact check” on this crazy notion that there’s a suicide problem at Foxconn. 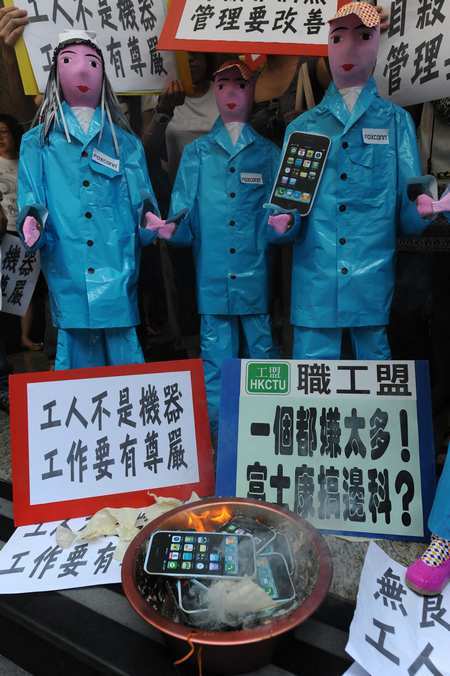 Again: media, not Foxconn, to blame. Mashable, which repeats the claim about Foxconn being below the national average and gives Apple props for being “saddened and upset,” even though, when you think about it, there’s no real reason for us to feel upset, since there’s actually nothing bad or unusual happening at Foxconn, statistically speaking. Cringely, who says, “not nearly as many workers are throwing themselves off the roof of that Foxconn factory in China as I would expect.” Yes, that’s right. He thinks there should be more suicides. Sigh. Great work by all of you. You’ll all be on the shortlist for advance review units of the second-generation iPad.